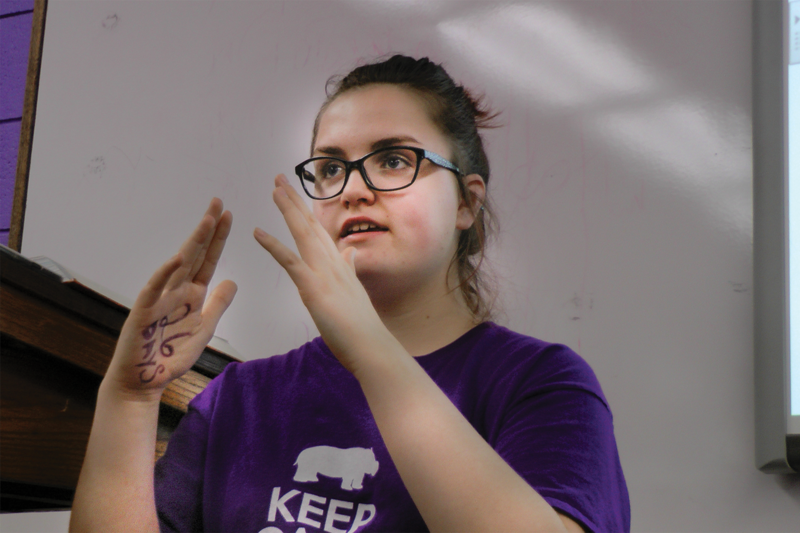 Freshman Emily Wachter teaches a word from American Sign Language (ASL) to the ASL Club during heir meeting last Wednesday after school. "I want to show other people how amazing sign language is," Wachter said. "I think that it’s so important that we learn ASL because [the deaf] don’t have anywhere to go. This is their place and we’re treating them like it isn’t." Every time she takes a science test, freshman Emily Wachter grips her pencil and tries to block out every thought running through her head. A potential F on her transcript. A wrong answer. The closet door she had left open in her room. She knows the material, yet self-doubt still infiltrates her mind. But once she begins fingerspelling each word of the multiple choice questions in American Sign Language (ASL) under her desk, her anxiety fades away. She gains the understanding she thought she had lost. Science tests are not the only instances in which Wachter uses ASL as a coping mechanism. She finger spells while reading books. She watches YouTube videos of people communicating with ASL when she’s angry. Wachter said sign language is at the top of her list of interests. She’s found a passion for speaking without words. And she says she couldn’t be prouder. Wachter discovered ASL in eighth grade, while she was at a middle school bowling practice with her mom. Two autistic brothers were there, communicating with each other using ASL. Something about their communication immediately caught Wachter’s interest. When she got home, she stayed up past midnight watching YouTube videos about ASL, mimicking and learning the different signs. Concerned about the time, her mom eventually came into her room and urged her to go to sleep. “I didn’t know what [ASL] was, but I just felt like I had to do it,” Wachter said. For the next six months, sign language was at the top of Wachter’s list of priorities. To this day, it still is. On the day of Wachter’s freshman orientation, the idea of starting PHS’s first ASL Club slipped into her mind. Wachter asked her English teacher, Victoria James, to be the sponsor of the club. Though James didn’t know ASL, Wachter’s passion was enough for her to say yes. Two of Wachter’s friends, freshmen Hayden Stevens and Ariel Powers, immediately supported her. They developed the same passion for ASL that she did. Wachter had the support of her teachers, school administration and friends. Now, all she had to do was decide on a meeting time. At the first meeting, 15 students showed up. Wachter stood at the front of the room, teaching the students ASL signs on Lifeprint.com, a resource site for ASL students and teachers. The club attendance numbers dropped the next few weeks, which discouraged Wachter. But with the support of James, Wachter pushed on. Eventually, ESOL students began attending. Wachter slowed down her teaching pace to accommodate for them and interacted more. New members come to the club meetings weekly. Wachter hopes for ASL to become a class. The ASL Club will continue meeting next year and is encouraging new members for the 2018-19 school year.